Air Chief Marshal BS Dhanoa PVSM AVSM YSM VM ADC, Chief of the Air Staff, led a four aircraft, MiG-21 ‘Missing Man’ formation flypast today, at AF Station Bhisiana, to honour the valour and supreme sacrifice of Kargil martyrs. The ‘Missing Man’ flypast is an aerial salute accorded to honour the fallen comrades-in-arms. The Arrow Formation of MiG-21 Bison, with a gap between two aircraft in the formation depicted the – Missing Man. Later, in a simple, yet poignant ceremony, he laid a wreath at the Memorial to honour martyrs who made the supreme sacrifice in the line of duty. Air Chief was on a three day visit to the station. 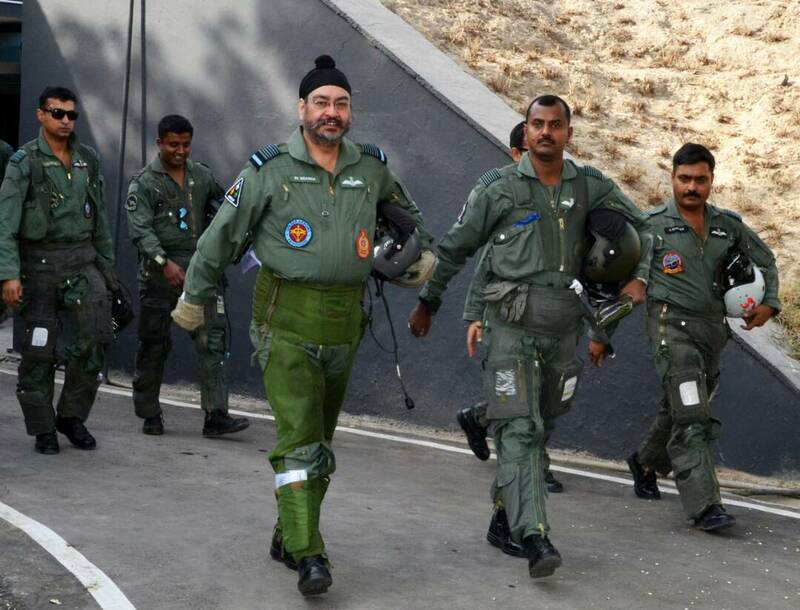 It is here, while commanding the 17 Squadron Air Chief Marshal BS Dhanoa had flown the MiG-21 T-96 aircraft, currently the oldest fighter in the IAF inventory. On this day in 1999, Squadron Leader Ajay Ahuja VrC (Posthumous) attained martyrdom during Kargil conflict. He was at that time the Flight Commander of 17 Squadron. Mrs. Alka Ahuja wife of Late Squadron Leader Ajay Ahuja VrC (Posthumous) was also present and the CAS presented her a plaque of ‘missing man’ formation. During his visit, the CAS also reviewed security and operational preparedness of the base. He complimented the personnel of the base for their combat readiness; and urged them to “learn from the past, practise in the present, and Win in the Future”.